Well, as any other breed Border Collies also need to be brushed and if you are owner of one you already know what I mean. 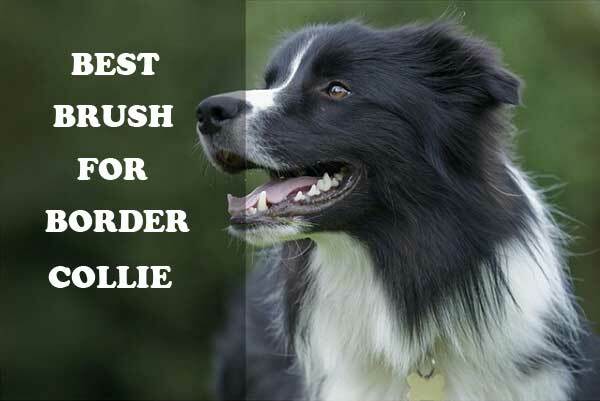 This article is about best brush for Border Collies, so you are at the right place. We will share lots of awesome brushing and grooming tips which will help you to maintain your dog’s coat healthy and good looking. The Border Collie is a breed known for its double coat, that can be rough and smooth. The outer coat is coarser one, whereas the undercoat is soft. If the dog has rough coat, then the length of it is medium, as you can notice feathering on the chest, legs and belly. Although, the smooth coat is coarser in texture than the rough one, the feathering is minimal and the length is short. The collie’s coat is black with a white blaze on the tail tip, legs, feet, neck and face, as some of the coats can have a tan. The color can vary from merle, tricolor, bicolor or solid one, as the only exception is the white color. The good thing about the coat of the breed is that you don’t need to put a lot of hard work and frequent grooming in order to maintain it. The only essential part of maintaining is the weekly brush, which will keep the weather-resistant double coat clean from mats and knots, as it will also boost the production of natural oils. When the shedding season comes, frequent brushing is the key of minimizing the hair that will shed and go over the furniture. Giving your dog a bath should not be more than 3 times a year, as you should do it only when the dog smells bad or gets dirty. Getting the right tools that will keep your dog’s coat looking good is not an easy job. While you are brushing, the chance of seeing dirt, stuck leaves, dust and debris is very big. That’s why investing in the tools mentioned previously can save you and your dog from a lot of stress and pain. To remove all the things that got stuck in the coat, the steel comb will help you out. The stripping comb is perfect for removing all the dead hair from the undercoat. 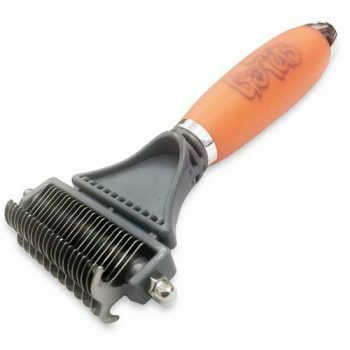 The slicker brush will do miracles to all the knots and mats that form very often, especially in the shedding period, all thanks to the bent wire teeth of the tool. A pin brush can be very useful, if your dog has a long hair. Daily brushing equals healthy and fresh looking coat. Every owner should be aware of the fact that brushing has many beneficial sides and should not be neglected. 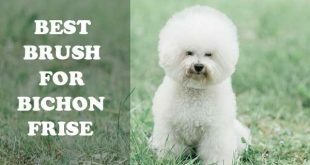 The brushing will prevent the annoying matting of the undercoat, remove all the dead hair, boost the distribution of natural oils and make the whole coat looking super silk and shiny. Every owner of dog with double coat knows how big of a struggle is the shedding. Although, the process is completely normal and occurs in the spring or early summer, a lot of people find it hard to keep the coat good looking. This problem can be reduced drastically with periodic brushing. The whole process is satisfying and very pleasant, as you both going to enjoy spending some more quality time together. One very important thing is to be dedicated and find time to do it, as once you neglect it, the outcomes can become unpleasant. Many owners find it nice to shave their dogs’ fur, as this can keep them stay cool in the hot summer days. Other reason behind the shaving is that the coat won’t need to be maintained, which saves a lot of time for some people. However, before going for it, you need to be aware that removing the coat can lead to sunburns, as the skin is left unprotected from the sunlight. It is not recommended to do it, especially if you own a merle-colored dog. Brushing dry coat can seriously damage the hair and lead to breakage. A spraying bottle, in other hand, can save you from a lot of trouble. You can fill the bottle with plain water or be more fancy and add coat conditioner diluted with water, as this will ease the process and bring protection to each hair. Start brushing from the top, as you go all the way down the body. First, brush the head, face, ears, neck as you go down to the front legs, as after that you start from the top again and do one long stroke till you reach the edge of the tail. After doing that, continue with the sides, as the brushing will go all the way to the rear legs. Never brush against the direction of hair growth, as you will make the dog feel uncomfortable and also lead to breakage. Another suggestion is to brush the under and upper coat, as well as down to the skin. This will prevent the formation of mats that will stuck into the coat and make the removing process very painful. You always need to brush the coat properly, as if you don’t do that, the dog will feel extreme discomfort. When it comes to bath time, the experience will become more painful, because when a matted fur gets wet, it traps the moisture near the skin. This will affect the skin and cause and inflamed moist circular lesions. The soft fuzzy hair behind the ears, which is also prone to form mats. If you brush this part often, the fur there will remain healthy and silky. A good advice is to thin this fuzzy hair, which will help you avoid unwanted matting. Once you brushed the upper coat, it is time to move to the undercoat and brush it down to the skin. This should be done very gently, as the Collies are known for their sensitive skin that can be irritated super easy. To avoid causing pain, be sure you don’t tug or pull the hair. Separate the hair to sections, as you start brushing from the form the inside out. When you brush the skin, do not use slicker brush, because of its wire teeth that can create slicker burn, which refers to nicks, scratches or welts. If you are trying to give your dog a silky and great looking coat, then brushing the coat every day for around 5 minutes will help you achieve the wanted results. This will also help you reduce the shedding. If you are limited on time, then a long brushing session just once a week will do the job too. After you went all over the coat add some specially designed coat dressing or oil, as those products will make the fur look fabulous and keep it healthy. If your dog’s coat is prone to debris, then such oils will get rid of them. After making everything clear, it is time to move on to the list of the best tools you should invest in. They will all come in hand and be the perfect choice for every Collie. 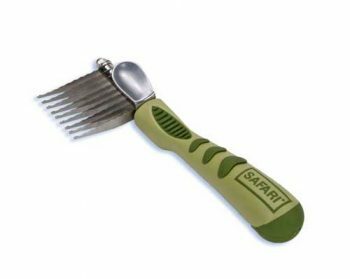 What is the best brush for Border Collie? You can never go wrong with slicker brush, as this one is a must have. In every grooming salon, you will notice that every professional uses one. The form of the brush is a flat paddle-like one, as you won’t mistake it with other ones, because of the fine wires. This brush will help you take a good care of the upper coat, as it is made in a way that follows the direction of the hair. The loose hair will be removed from the coat, thanks to the fine wires, that will go all over the coat and won’t miss a single spot. A lot of professional groomers recommend it for coats prone to form knots and tangles. Because of the long outer hair, tangles can occur very often. 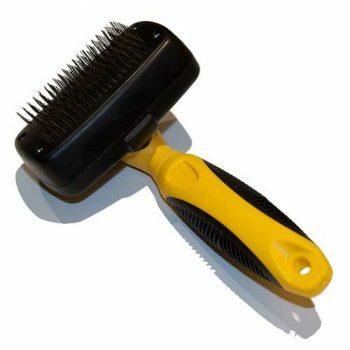 The slicker brush will prevent all those potential problems, as it will remove the dead hair and leave the coat fresh. Those are the most common reasons why a slicker brush should be owned by every dog owner. Removing the shed hair is super easy, as using the brush on a daily basis will benefit the fur of the dog in many ways. As every other product, this tool also has disadvantages, as the main one is the metal wires that can irritate the skin, if you are not the brush gently. This should not be a problem, once you find the right technique of brushing. The best way to avoid unpleasant outcomes is not to apply a lot of pressure. Pro Slicker Brush is one of the best suggestions on the market, as it is the ideal choice for every breed. If you check this brush online, you will notice that it has top rating and almost every comment states that the brush is outstanding. As it was mentioned previously, slicker brushes drag all the trapped dead skin, as the Pro Slicker one does that super easy and effortless, leaving the coat of your dog looking magnificent. Border Collies are known for that their coat does not form tangles and mats easily, but if this happens, the Pro Slicker brush will solve the problem in no time. The best thing about this brush is that it comes with 10 years guarantee period. If you are not happy with the purchase, you can easily turn it back and get your spent money. This brush will satisfy everyone that has high standards, as the product is crafted to be extremely durable and be used for long periods of time. This brush got your back in every moment, as it won’t give up on you no matter what. The warranty period is one year, which is a guarantee that the product really is amazing. After you brushed your dog’s coat, it is time for the cleaning part, which for your surprise has never been that pleasant, as all you need to do is to click the auto-clean button that will retract the metal pins, which makes picking the removed hair super effortless. This will prevent a lot of mess that can occur after a brushing session, especially when it is shedding season. Now, you can collect the hair just with one easy step, that will save you a lot of time. The metal pins are high quality ones, as they are super flexible. This results in better brushing, which won’t harm the skin in any way. If the brush catches tangles, your dog won’t feel any pain or gets uncomfortable while you are brushing the mess. The brush can be a great addition to your maintaining kit, as it will ease the process of untangling any teasels and tangles, removing shed hair. 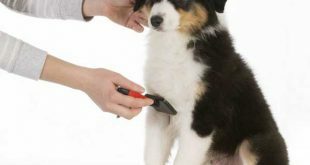 The tool can be used after a grooming to soften the coat, as for final touches you can go over the fur with a pin brush. The best for last- When you buy this brush, you will help the American Animal Rescue Society, as 15% of the cost of every brush goes to this foundation. This is another great reason why you should give this tool a try. The coat of your dog will look absolutely fascinating once you start using this brush. Next up is a product known for its ultra-lightweight feature that makes it top choice. The Chris Christensen is a brand that won’t disappoint you, as their pin brush will make the maintaining process of the coat very delightful. Almost every person that purchased it is more than satisfied with the product, due to its steady and high quality crafting. The durability and high quality of the brush are achieved, because of the used solid beech wood. The precise tips of the high quality stainless steel pins will guarantee for perfectly brushed coat, that will look astonishing. The brush is a high quality one, as it is manufactured in Germany, following all the standards. The tool is reliable, as it will go through everything and still remain sturdy. 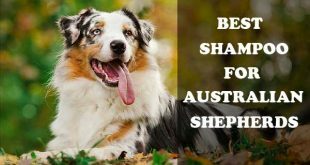 This product is the perfect choice for owners of St. Bernards, German shepherd and Border Collie. A lot of owners have been asking how to choose between a pin and a slicker brush. Although, the similar actions, they have minor variations. 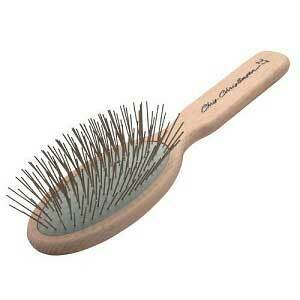 You should get a slicker brush if you have to remove shed hair and tangles. The pin brush, in other hand, helps to realign the coat, as it lifts away the shed hair. However, many owners find the pin brush the better choice, as it is smoothing and separating the hair. Another reason behind this choice is that the pin brush reaches the depths of the coat, as it works gently, without snagging the fur. In conclusion, the pin brush is the excellent selection for everyone that wants to achieve great looking coat free of tangles. If your priority is to maintain the coat of your dog healthy and shiny, then combs are going to find a special place in your kit of tools. Every grooming salon owns combs, as they are essential tools that make the grooming process completed. Groomers use combs if the coat has tangles, as they are removed easily, in no time. In order to get the idea of how important combs are being to imagine that they are necessary to keep your hair looking silky. If you have a long hair, then you know how hard is to brush it, as it often forms tangles. Combs are made in a way that get rid of the tangles, as it brushes the hair till it gets sleek. Combs are extremely important for your Collie’s coat, because of its long outer coat. The knots are caused by hair that is rubbing against hair, as this can be found behind the ears, in the armpits and between the back legs of the dog. To put an end of the tangles once and for all is to comb through the coat after exercise. The best thing is that you don’t have to pay a lot to keep your dog’s coat knot free. 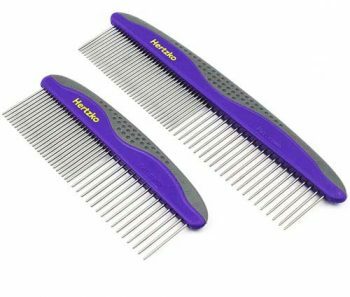 This kit will make miracles to your dog’s coat, all thanks to the two combs with different size. The reason behind the size is in their gauge halves, which are totally different. The gauges are wide and narrow ones, as the narrower gauge is perfect for tighter places like behind the ears, while the wider one is ideal for larger areas, like the breeches. The handle of the product is extremely comfortable, as it is made of rubber, which will make the usage of the tool pleasant. The kit is budget friendly, which is another great plus. You can purchase it from Amazon. This tool will make the annoying task of deshedding easier than a child game. If you are tired of going around the house and cleaning all the fur balls, then getting this product will leave those worries behind. Putting up with excessive hair is a struggle known by almost every dog and cat owner. But don’t lose hope, because the GoPets dematting comb is here to solve your problem. It will remove all those mats and tangles you worry about all the time. 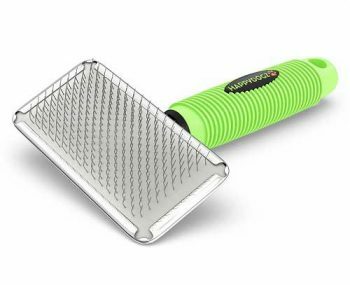 The product will cut all the mats and tangles right away, thanks to the sharp stainless steel blades, that won’t pull the hair out. The dull rounded ends of each tooth guarantee that the skin of the dog won’t be scratched or irritated. You will be more than satisfied with the result and its comfortable design. If you want to help animals in need, then when you purchase this product, you donate a part of the cost to no- kill shelters and animal charities, which is great news. Just because you are on budget, this does not mean you can’t maintain your dog’s coat. This product will help you achieve great looking coat without breaking you bank account. It is super effective when it comes to removing knots and tangles, as it will always be by your side when you need it. The results will be delightful, no matter the length of the hair. You can’t go wrong with this product, as it is highly appreciated by many owners and groomers. Never forget to always use it on the direction of the hair growth, if you want to achieve the best results. The design is all you will ever dream of, as it is lovely and professionally looking. The multi-functional tools are the best ones, as they are cost-effective and space saving. 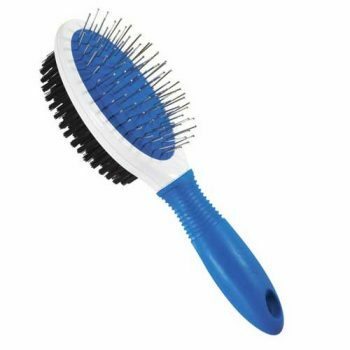 If you dog have a sensitive skin and you need a product that will work gently, then you cannot go wrong with this brush that has rounded tips of the pins, which are covered in a soft rubber cushion. The brushing will be delightful for both of you, because of this cushion. The product is multi-functional one, because it has two sides- one of them to remove the spotted out tangles, as with the bristle side you will smooth the fur and remove any left shed hair. The only minus is that the pins will loose and dislodge after a decent usage, just because the only anchor is the rubber cushion. Another thing that may confuse the buyers is the bristle side, because getting used to the dislodge of the dead hair is knotty. Once you find the right technique, the problem will go away. When it comes to the price, you will be more than satisfied, as it is super inexpensive. The Collies coat can become smelly, tangled and dirty, just like our hair. The good thing is that you won’t need to bath you dog often, as every 6 – 10 weeks is enough. All you have to do is to brush over the coat on a daily basis. When it is bath time, be sure to do a quick brush in order to remove the loose hair, as once the coat gets wet, the bathroom will turn into a real mess. Because a lot of dead hair falls off, be sure to place a hair trap, if you don’t want to clog the drain. To keep the coat healthy and good looking, be sure to purchase a coconut or oatmeal based dog shampoo. Do not over-bath your dog, as this can lead to some serious problems to the skin and coat. If you give your dog baths too often, this can stop the production of the essential natural oils. The skin can become dry and irritated, which is not what you or your dog want. 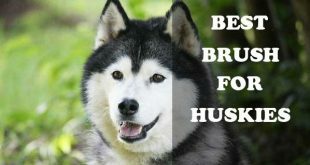 I hope this article will help you to choose the best brush for your Border Collie. Feel free to drop a comment what brush (and other grooming tools) do you use? Next Can Dogs Eat Mint Leaves? Is Peppermint Safe or Bad for Dogs?